Symbolic Math Toolbox™ uses the MuPAD® language as part of its underlying computational engine. The language has an extensive set of functions that are optimized for creating and operating on symbolic math expressions. Since the R2016a release of MATLAB® the recommended approach is to use the MATLAB Live Editor instead of the MuPAD notebook for performing and documenting symbolic math calculations. MuPAD notebooks will be removed in a future release. 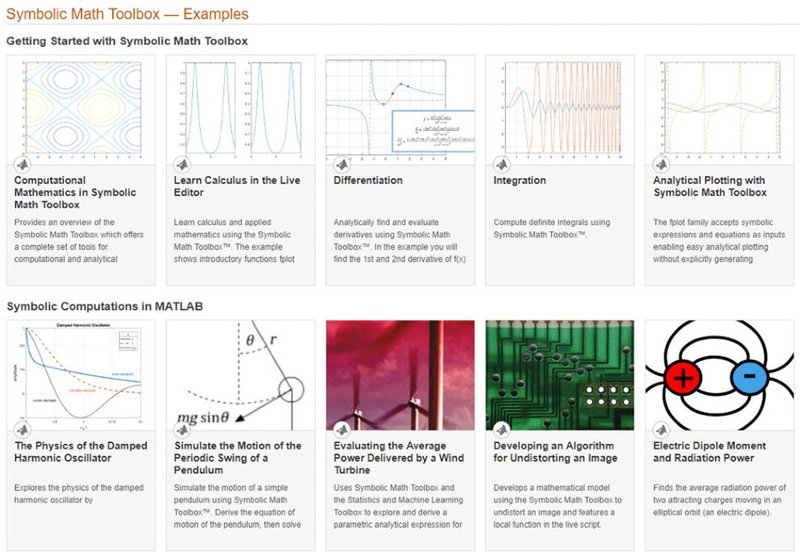 These resources help you get started using the MATLAB Live Editor. 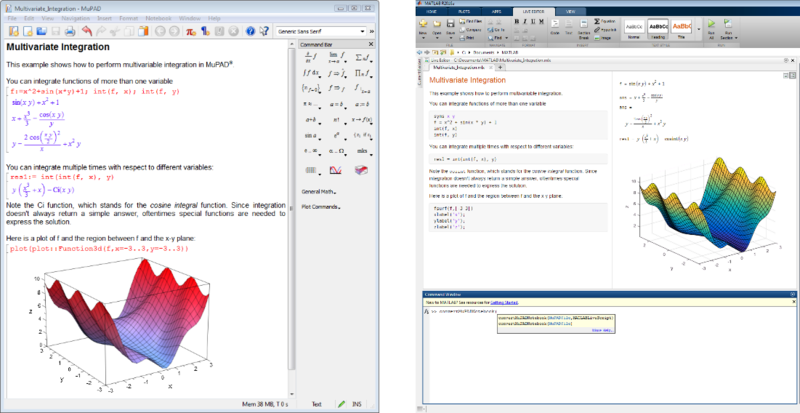 Performing analytical integration in the MuPAD notebook (left) and in the MATLAB Live Editor (right). The MATLAB Live Editor is an interactive way to create, edit, and run MATLAB code. In a single environment your symbolic math computations are displayed in mathematical typeset, along with formatted text, multilingual text, equations, images, and hyperlinks. You can share live scripts with others to accelerate exploratory analysis, create interactive narratives, and teach with interactive documents. The MATLAB function convertMuPADNotebook helps to convert your MuPAD notebooks to MATLAB live scripts. You can also open a MuPAD notebook as a live script by right clicking and selecting Open As Live Script. For further assistance converting your MuPAD notebooks, contact MathWorks Support. Converting a MuPAD Notebook (top, left) to a live script (top, right) using the convertMuPADNotebook function (bottom). The MuPAD notebook will be removed in a later release. Its use is discouraged, but if you still need access to the MuPAD notebook, you can start it with the MATLAB function mupad.